GRAND STAIRCASE-ESCALANTE NATIONAL MONUMENT — Stroll through some of Southern Utah’s most bizarre formations along this 9.2 mile round-trip hike to the Wahweap Hoodoos in the vast Grand-Staircase Escalante area near Lake Powell. Mother nature’s erosive artistry has left several groups of divine pearly-white towers capped with brown mushroom-like tops nuzzled in several coves for off-the-beaten-path hikers. 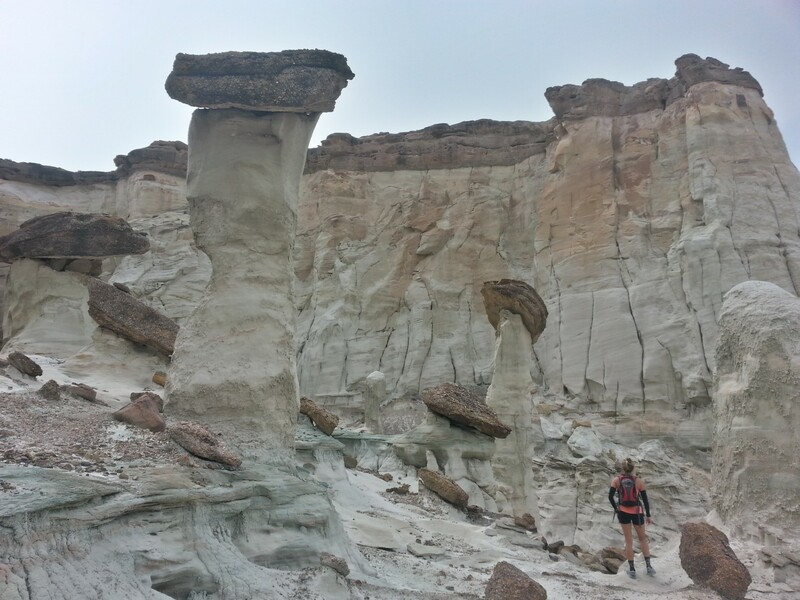 The geology of these giant mushroom stalks involves two parts, the towers and the flat-brownish caps which teeter on the tops. The towers themselves have been sculpted out of fast-eroding, ghostly-white Entrada sandstone, which up close appear so fragile they might blow away with the next stiff wind. Many of Utah’s breathtaking rock formations, like the “Delicate Arch” of Arches National Park were sculpted out of this layer of sandstone. The caps on top are made up of harder conglomerate rock which has protected the soft-rock below it, from the insistent wind and rain erosion over millions of years. As the land around it has melted away, the protection from the top layer has left these bizarre towers alive. Sadly, if you don’t visit this site in the next few million years, they’ll surely be gone with the wind. 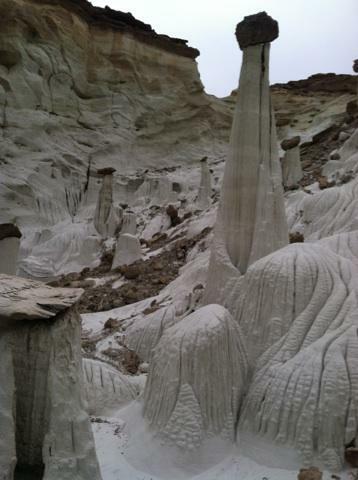 These hoodoos are made of extremely soft sandstone, that is easily damaged. Stay on social trails, keep a distance from the delicate formations, and refrain from touching them. These are suggestions from the land managers of the Grand Staircase-Escalante National Monument. Please follow the rules so we can keep these beautiful places open to the public. This hike is a remote, unmarked trek which follows the highway-sized, typically dry, Wahweap Wash for 4.6 miles going in, and the same distance coming back. Although this hike involves very little elevation gain and hardly any obstacles of note, there is no shade, no civilization and no cellphone service for miles, so bring plenty of sunscreen, water and food. Whenever you’re entering the desert, plan for the worst case scenario. Ask yourself, what should I bring that I will need if I get stuck out there? The hike is as easy as this: Follow the highway-sized dry river bed – Wahweap Wash – north until you see the first cove of hoodoos 3.5 miles up the wash. There are three separate coves of hoodoos all on the left, or west, side of the wash. 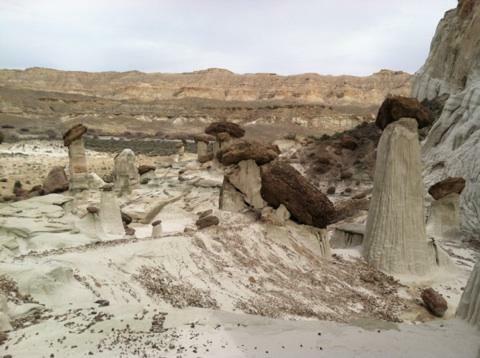 The last cove of hoodoos is approximately 4.6 miles from the trailhead. Once you’ve got your feel, turn around and head straight back to your car. About an hour east of Kanab, on U.S. Highway 89, turn left onto Ethan Allen Road between mile markers 7 and 8. Follow this road for a short distance through the rural town of Big Water. When the road comes to a T, stay left. The road continues past several fisheries and across a low-flowing river. Approximately 4 miles from Highway 89, find a pullout and park. You will see a highway-sized wash nearby on the northwest side of the road. There are no traditional trailhead markers. The hike begins when you enter the dry river bed. In April 2014 this was a well-graded gravel road all the way to the beginning of the hike. The road crosses a river, but the water was low enough and the road was graded well enough that a passenger car made it easily to the beginning of the hike. However, if you’re not used to driving on dirt roads this may be a challenge. This road would most likely be impassable during a rainstorm. You can easily park before the river crossing and start your hike half-a-mile earlier. In typically dry desert river bottoms, always be on the lookout for flash flooding. Remember that just one foot of flowing water is powerful enough to sweep vehicles off the road, according to the National Oceanic and Atmospheric Association and the National Weather Service. During a flood, if your vehicle stalls, abandon it immediately and seek higher ground. Rapidly rising water may engulf the vehicle and its occupants and sweep them away. NOTE: There are a few other ways to access the hoodoos but this is the most common. It makes me nervous that an “easily damaged” wonder is being advertised in the St George newspaper- guess I better go before it gets ruined. I’ve been a couple times, its much better in cooler weather. My first time out was a little over 100 degrees, bring plenty of water. The views are worth the hike.